Liverpool ace Virgil van Dijk has revealed what he said to Arsenal defender Sokratis as the pair appeared to be involved in a heated exchange on Saturday. 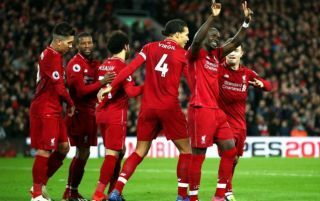 The incident occurred as the players were heading towards the tunnel at Anfield at half-time during Liverpool’s 5-1 win over the Gunners. Instantly, it appeared as though Sokratis took issue with Mohamed Salah, before Van Dijk got in the middle of the pair and was seen exchanging words with the Greek international. The Liverpool defensive ace has since confirmed that is essentially what happened, insisting that he was merely defending his teammate against allegations that he had dived in the first half. “I saw that he went to Mo (Salah) and was saying that he dived. He was attacking him a bit, but I wanted to say he didn’t dive,” he is quoted as saying by the Metro. ‘Obviously everyone came around us and it looked like we were fighting or something but we weren’t. I just wanted to talk to him. But that happens in football and we move on. It sounds as though more was made of the situation that was necessary, but it doesn’t take away from the fact that this is a very class and commendable move from Van Dijk to show his leadership qualities. The Merseyside giants have looked a different side with him marshalling the backline during games as it has led to an unbeaten start to the campaign after 20 games and a seven-point lead over Man City. However, based on this exchange, it appears as though his influence isn’t limited to the pitch, as he stands up and is counted when it matters off the pitch too which goes to show just how fundamental he’ll be to the team in the coming months as they look to win major honours.